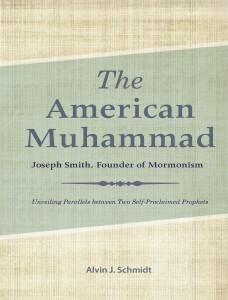 In The American Muhammad, Alvin Schmidt undertakes the challenging but informative task of documenting, discussing, and analyzing more than seventy parallels between Joseph Smith (the founder of the Mormon Church) and Muhammad. Schmidt elucidates the necessity of studying such parallels as we seek to understand why the similar acts of these individuals left major marks in history. This fascinating book provides many facts not commonly known about Joseph Smith and Muhammad and will help readers see and understand how the teachings of these two men contradict biblical Christianity. The following excerpt introduces some of Schmidt’s parallels. None of the prophets in the Old Testament ever organized a new religion, but Muhammad and Smith did. Both men saw launching a new religion as a function of their prophetic role. Muhammad formed and organized the religion of Islam in A.D. 622 when he completed his hijra to Medina, and soon his house in Medina became the prototype of future mosques. It was in Medina, according to Ibn Ishaq, that he formally had the first muezzin Bilal to beckon forth the call to prayer. That call was soon announced publicly five times each day, known as Salat. It became the second of Islam’s five pillars. The first pillar Shahada is Islam’s religious confession. It states, “There is no god but Allah, and Muhammad is his messenger.” Zakat (third pillar) is the giving of alms, 2.5 percent of a Muslim’s income to Muslims in need. Sawm (fourth pillar) is the requirement of fasting during the month of Ramadan; and Hajj (fifth pillar) is the annual pilgrimage to Mecca every Muslim is expected to perform at least once in a Muslim’s life. Thus, early in the formation of Islam, Muhammad not only made himself head of his new religion, as confessed by every Muslim in the Shahada, but he also made the other four pillars permanent components of Islam’s organizational structure. When Smith founded his church in 1830, in western New York, he made himself head of it, similar to what Muhammad did with regard to Islam. Then after he and his followers, under social pressure from the area, migrated from western New York to Kirtland, Ohio, in 1831, he soon proceeded to implement various organizational features. In June 1831, he introduced the High Priesthood in Kirtland, and in 1835, in accordance with the directives of a revelation, he established the First Presidency that consisted of him and two counselors. That same year he also formed the Melchizedek Priesthood and the Aaronic Priesthood (D&C 107). He gave the former more power and authority than the latter. “The mystical powers of [the Melchizedek] priesthood blended with the everyday business of running the church.” Next, he established the Quorum of the Twelve Apostles and also the Council of the Seventy. By 1836, he and his followers had completed and dedicated the first Mormon temple that took three years to build. And he also introduced additional organizational components in Kirtland between 1831 and 1837. Later, especially in Nauvoo, Smith introduced still more organizational features and rituals. On August 15, 1840, he preached a funeral sermon in which he for the first time mentioned baptism for the dead, and “within weeks, baptisms [for the dead] were performed in the Mississippi River.” General George Washington, first president of the United States, was among the first for whom a vicarious baptism for the dead was performed in the Mississippi River at Nauvoo. Baptism for the dead continues to be a major plank in Mormon theology, and some unusual individuals have been baptized by proxy. For instance, on December 10, 1993, the LDS in its temple in London, England, performed a proxy baptism for Adolf Hitler. Two months after Smith had become a Freemason in March 1842, he brought into existence the first Endowment Ceremony. Individuals were anointed, washed, wore special garments, and taught special signs and tokens of the holy priesthood. Some of the secret signs, tokens, and keywords he incorporated from Freemasonry. Then on July 12, 1843, he also received a revelation (D&C 132) that initiated temple-performed marriages that still are performed today. These marriages seal (bond) a couple for time and eternity, giving them “the highest exaltation in the hereafter.” To Smith’s liking, this revelation also approved plural marriages. When Muhammad and Smith each organized a new religion, they created two powerful forces that undermined Christianity, an effect that continues to the present day. For instance, Muhammad’s Islam does this by denying Christ’s crucifixion (K 4:157), as noted earlier. And Smith’s Mormon church does this by teaching that the church is “abominable” and that “the devil . . . was the founder of it” (I Nephi 13:6). . . .
Muhammad and Smith said they would restore true religion, but by rejecting various biblical teachings each ironically founded a religion glaringly antithetical to biblical Christianity. For instance, in addition to denying the crucifixion of Jesus Christ, Muhammad also unleashed numerous other teachings and practices that undermined Christianity. Notably, (1) he denied the Christian Trinity, as shown earlier; (2) he rejected the Fatherhood of God, contrary to Jesus’ frequent reference to God as his Father; (3) he portrayed God as totally transcendent from the life of human beings, whereas Christianity pictures God as one who cares so much he even sent his Son to suffer, die, and rise from the dead for the sins of mankind; (4) he advocated the use of violence to promote and advance Islam, as is evident in the Koran’s numerous “sword passages” (stated as imperatives to kill “Infidels”), whereas the New Testament opposes all forms of personal violence; (5) he taught that Muslims (“believers”) had to perform good deeds to enter heaven: “If any do deeds of righteousness, be they male or female—and have faith, they will enter Heaven, and not the least injustice will be done to them” (K 4:124). This latter teaching is at odds with what biblical Christianity teaches. “For by grace you have been saved through faith. And this is not your own doing; it is the gift of God, not of works, so that no one may boast” (Ephesians 2:8–9). In addition to seeing the church as being abominable and founded by the devil, Smith taught other doctrines that undermined biblical Christianity. For instance, (1) he introduced baptism for the dead, a practice that apparently some erring Christians performed in Corinth during St. Paul’s time without any biblical command or precedent to do so. Traditional Christianity has never accepted or practiced baptism for the dead throughout its twenty centuries; (2) he taught that there were multiple gods (D&C 121:32); (3) he denied the oneness of God by teaching that the Father, Son, and Holy Spirit “constitute three distinct personages and three Gods;” (4) he rejected the biblical teaching that God is Spirit, as taught in John 4:24, by saying, “The Father has a body of flesh and bones as tangible as man’s” (D&C 130:22); (5) he said Adam’s fall into sin occurred so “that they [men] might have joy” (II Nephi 2:25). This latter teaching is at variance with the biblical message that states, “[J]ust as through one man sin entered the world, and death through sin, and thus death spread to all men, because all have sinned” (Romans 5:12). Thus, according to the Bible, Adam’s sin did not bring joy, but death to mankind. Richard Lyman Bushman, Joseph Smith: Rough Stone Rolling (New York: Alfred A. Knopf, 2006), 258. D. Michael Quinn, The Mormon Hierarchy: Origins of Power (Salt Lake City: Signature Books, 1994), 631. Helen Radkey, “The Mormon Church Attempts to Conceal Temple Records for Adolf Hitler,” www.utlm.org/onlineresources/hitlertemplework.htm (accessed January 9, 2012). 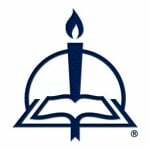 Jerald and Sandra Tanner, Major Problems of Mormonism (Salt Lake City: Utah Lighthouse Ministry, 1989), 230. Smith, Teachings, op. cit., 370. From The American Muhammad: Joseph Smith, Founder of Mormonism, pages 88–90, 91–92 © 2013 Alvin J. Schmidt, published by Concordia Publishing House. All rights reserved. To order The American Muhammad, please contact CPH at 800-325-3040 or visit www.cph.org.